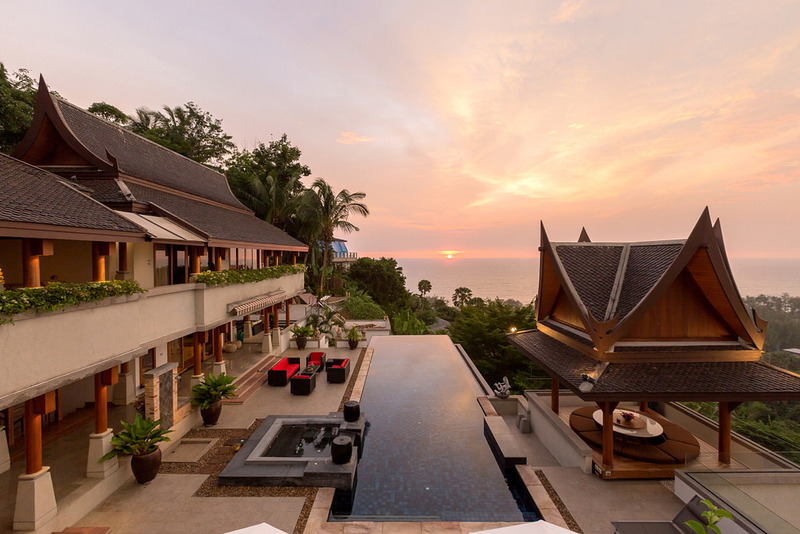 A highly desirable and private, tropical villa, set in the Surin hills with panoramic sea views. It is likely to be one of the most sought-after private villas available on the island, due to its excellent location, large size and as new condition, all combined with a price that is well below replacement cost. The villa is in excellent condition having been immaculately maintained by a keen yachtsman who has paid meticulous attention to the upkeep of the property. The teak wood is beautifully maintained to marine standards. The villa also benefits from a very functional layout set over three levels. The central theme is oriented towards an alfresco lifestyle but maintains both formal dining and entertainment pavilions. With dramatic high cathedral ceilings, there is a feeling of expansive space that is reinforced by breathtaking panoramic views overlooking the sea and Amanpuri. The villa is set on a hillside in good sized grounds of over 2,400sqm. The villa features both formal and informal indoor and alfresco living areas, six large guest bedrooms, with en suite bathrooms, twin kitchens, twin maids quarters for easy main staff and any accommodation, especially large storage areas, a garden, twin parking and of course a fantastic pool with surrounding terrace space for entertaining and open air salsa for dining, relaxing and massage, all overlooking the beautiful Andaman sea and Surin beach. Taking the levels and rooms in greater detail: Entrance to the property is through a either a private gate or the electronically-controlled gates to the covered double car park. To the left of the first entry gate there is a private garden area. 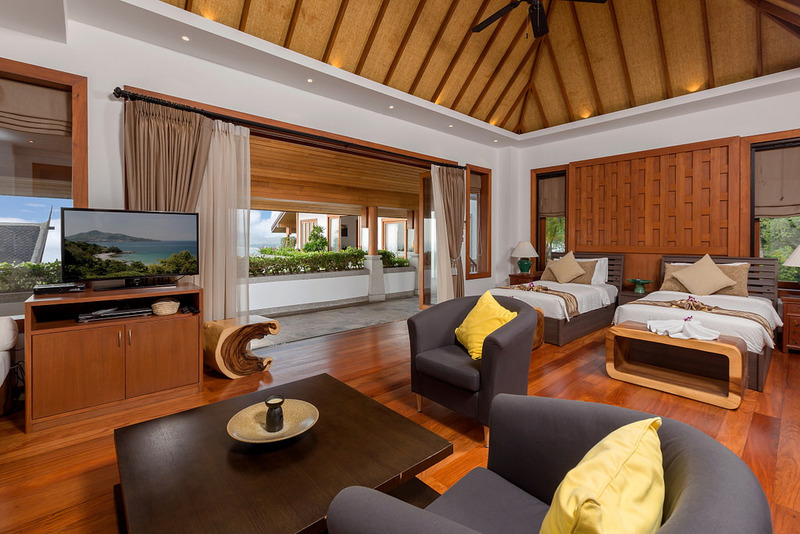 The upper floor of the villa is the more formal area and is home to a substantial living room, which has not only spectacular sea views, but a rich, highly-polished wood floor and a cathedral-style, wood-lined ceiling, with fans. This pavilion has floor-to-ceiling windows on all four sides, each with access points. There are chairs and a matching sofa with an emphasis on comfort, and a large flat-screen TV for added relaxation. The dining pavilion is to the left of the living room and also has a vaulted ceiling and fans. Furnished with a long table, perfect for entertaining, which more than comfortably seats eight, the views to the horizon are exquisite. To the rear is an immense, extremely well-appointed kitchen. There are extensive polished-wood cabinets, with a black marble counter top, and encompassing a central island which is split to provide a breakfast bar to one side, and ample preparation space on the other. The equipment includes a dishwasher, 6-ring hob with overhead extractor hood, an integrated microwave, a large integrated oven and a substantial cabinet fridge/freezer. To the rear is a further Thai kitchen, which is also fully-equipped with a dishwasher, both a gas and electric hob and wide extractor hood, an in-built deep-fat fryer, microwave and large fridge freezer. This additional kitchen is excellent for entertaining or for pungent Thai cooking. The master bedroom is to the right, with a vaulted ceiling and fans, it has a pedestal bed positioned to take advantage of the views. Behind is a large room, split to accommodate on the right side, a spacious dressing area, complete with extensive wardrobes and drawers, as well as a vanity unit. And on the left, is a well-appointed en-suite, with large Jacuzzi bath, walk-in shower and twin wash basins, with large mirrors above and additional storage below. The private terrace at the front of the room is covered and has a roller blind to allow use of the area whatever the weather. The mid-level is accessed via either a spiral staircase, or a standard stairwell next to the dining room. Descending the spiral staircase, the area at the bottom has a waterfall feature to the left, whilst the right sides gives access to the immense entertainment area. This has a cool, marble floor, ceiling fans and a fully-equipped bar at one end with a drinks fridge, high-top bar and stools. The half-shuttered windows to the left all open to allow the through breezes of the fully-open area to the front of the villa. The other end of this room has a large flat-screen TV, but can be used as a further dining area if required. To the left of the bar is a second bedroom. This has a wall of French windows to the front for maximising the sea views, extensive fitted wardrobes and drawers, and an en-suite bathroom with walk-in shower. To the right of the TV area, there is a convenient cloakroom equipped with a separate w/c, a glass shower cubicle, hanging space and drawers plus a steam room. Next to this is a third bedroom. This is a duplicate of the master bedroom above, with the exception of the private balcony. All this accommodation looks out onto the large, infinity-edge swimming pool. This has lovely waterfall features to either side which extend two storeys and provide a gently trickling backdrop. There are two salas; the one to the left of the pool is set up as a dining area, with fitted wooden bench seating and a large central table, whilst the one to the right has a big Jacuzzi bath with inset seats, sufficient for 8 people. Both these areas offer sublime views across the bay, by day or night and make for excellent entertainment venues. Stairs lead down to the lower level from either side of the pool, and on the turn, each has a good-sized storage room to accommodate the pool furniture. 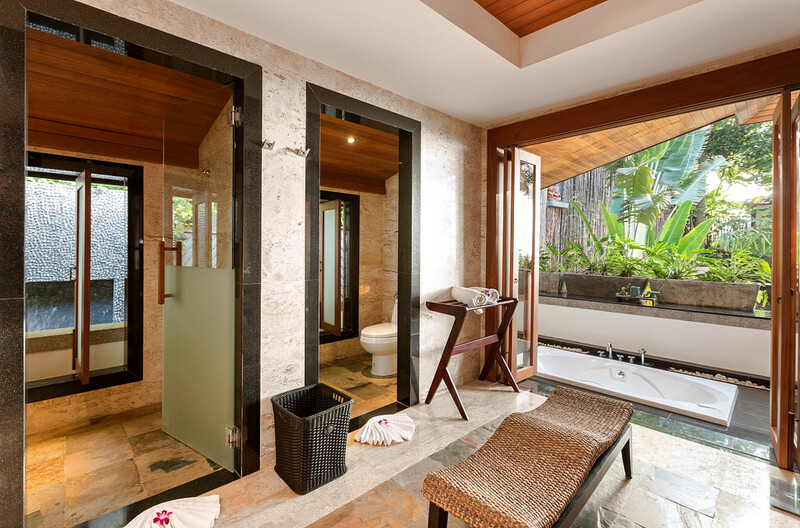 To the left is a large guest suite, comprising an extensive dressing area to the left, a well-appointed en-suite with Jacuzzi bath, overlooking a pebble garden and the waterfall feature. 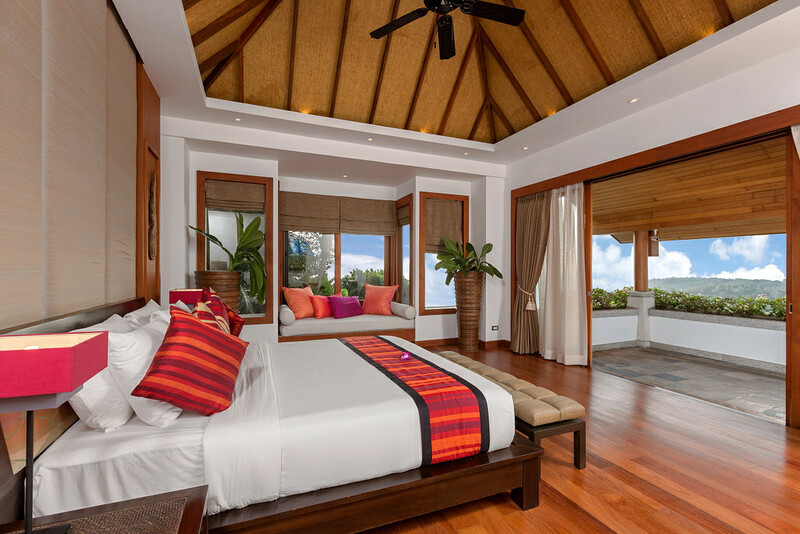 The main body of the bedroom faces the sea views across the vivid tropical foliage to the fore, and has a private covered balcony. To the right, the staircase leads to two further guest suites. The first is a duplicate of bedroom four, whilst the sixth and final is entered via the oversize bathroom. This has a lovely marble floor giving a cool feeling to the room. A Jacuzzi bath takes the central position against the back wall, with a separate w/c and walk-in shower cubicle to either side. In front of these are wash basins, with large mirrors above and storage below. 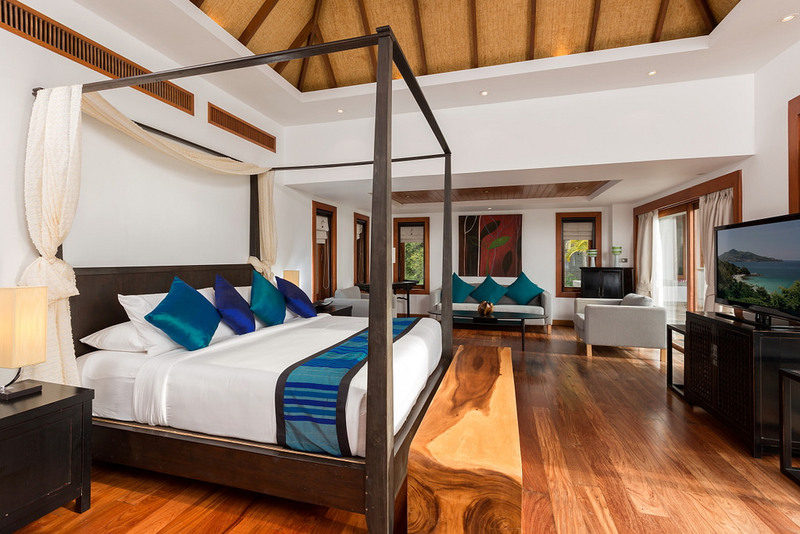 The bedroom benefits from copious fitted wardrobes and drawers, and has a lovely four-poster bed, from which you can relax and absorb the turquoise waters of Surin Bay, beyond the covered private balcony. All of the living accommodation benefits from individually-controlled, ducted air-conditioning. The villa is totally private and not overlooked thanks to its dominant position within the secure, gated community. 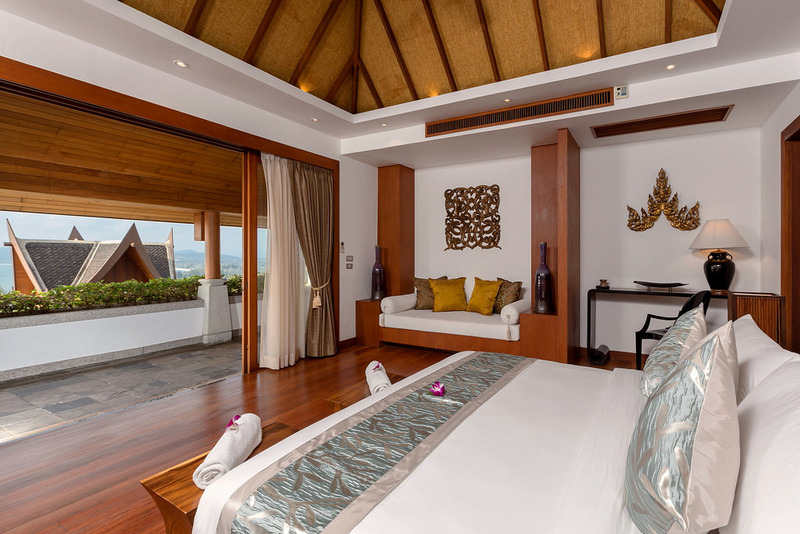 The villa is located in the heart of Surin within easy reach of the some of the best beaches in Phuket, excellent restaurants and the island’s top resorts and golf clubs.